Key ingredients- Flour, sugar, baking powder, and many more. Orchids are a species of flowers that can survive either on ground or underground. Size, shape and texture of the plant all depends on the habitat of the plant. Who doesn’t love it when you get all the things that you need at one place. 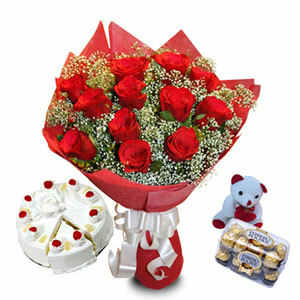 This gift hamper is a perfect choice to gift to your loved ones. It contains purple orchids, Ferrero Rocher, chocolate cake and a teddy bear. This bumper hamper can turn anyone’s dull day into a memorable one. 5 Lovely gift hamper for my husband. I purchased this hamper on my wedding anniversary for my husband. And, he was thrilled to such amazing hamper in front of him. Every product in this hamper deserves a big clap from us. The quality of the cake and flowers were just bang on. Thumbs up to the services giftalove. Seeing this beautiful hamper in front of me on my birthday, I was so flabbergasted that it made be jump up and down with. Every item in this hamper was my favorite. The chocolate truffle cake was delicious and fresh. The bouquet of orchids looks majestic and the teddy bear was extremely cute. I have thanked my parents for this hamper but now it feels really great to post this review on giftalove site. Thanks Giftalove.